1. Can be served room temperature. 2. Can pair with multiple wines. 3. Can be prepared ahead – Party day is hair and nail day, sorry. 4. Can offer something unique and approachable. My go to dish? Spanakopita – a Greek dish (in honor of my grandfather) of spinach and pungent cheeses wrapped in layers of buttery, flaky filo. My go to wine? Bubbles, bubbles, always bubbles. Nothing says special occasion like a bottle of bubbles. The flutes, the history, even the theatrics of opening the bottle let you know you are in for a treat. 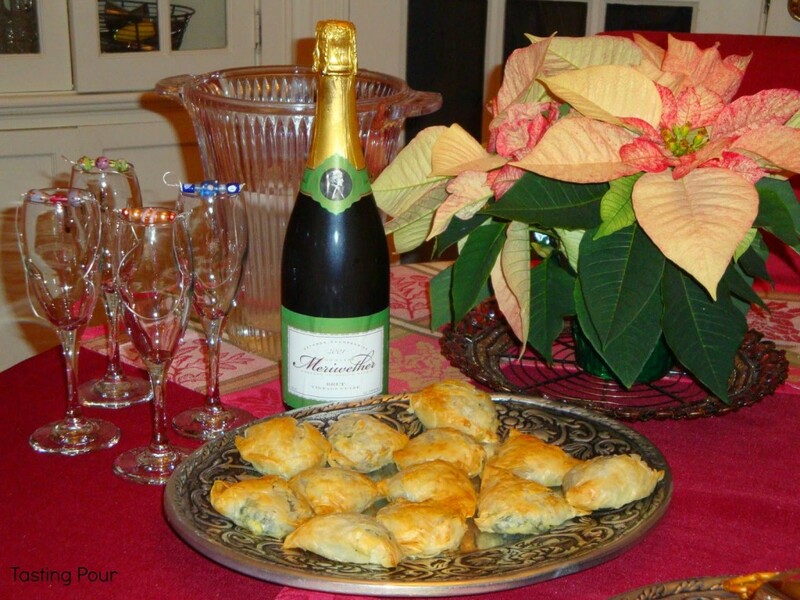 Let’s get started on the December 2014 Wine Pairing Weekend project – sparkling wines and hors d’oeuvres. Domaine Meriwether 2001 Vintage Cuvee from Eugene, Oregon. Made in the traditional method, with 10 years on lees, this has all of the appeal of champagne with a $28 pricetag. Plus it was named for Meriwether Lewis – as in Lewis and Clark. How cool is that? The yeasty, bready pungency of this wine is a match for our spanakopita rich with stinky cheese. The crisp, acidic structure of sparkling wine lifts this slightly heavy dish. Sparkling wine is a well kept secret at some Oregon wineries – a treat in the tasting room. With great growing conditions for Pinot noir and Chardonnay it is not a surprise that Oregon would make excellent sparkling wines. This specific wine may not be available in your area. Here are some of our other favorite bubbles and recommended sparklers. 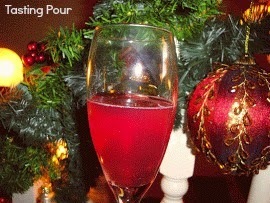 If sparkling cocktails are your thing then don’t miss our recipes for cocktails that sparkle. For more information on sparking wine and champagne see our series. Make this dish ahead and freeze until party day. Makes party prep a snap and your guests will be impressed. Saute onion, garlic and spices in olive oil until onion begins to brown. Combine onion mixture in big bowl with spinach, cheeses, and eggs. Cooks tip: Can store mixture in fridge or freezer at this point for future use. Place two sheets of parchment paper side by side. Open and unroll filo on one sheet. Cover immediately with plastic wrap and a damp dishtowel. Remove one sheet of filo and place on adjacent parchment paper. Cover stack immediately. Brush filo sheet with melted butter – not to saturate. Place approx. 2 tablespoon of spinach/cheese mixture on the middle of the bottom edge of buttered filo, Fold right third inward and left third inward to cover filling. Roll mixture up diagonally, like a flag, to form a triangle. Brush with butter and transfer to cookie sheet lined with buttered parchment paper. Don’t worry if dough tears. Use your butter like glue. Bake at 350 for 20 - 25 minutes. I like mine really brown so I often turn on the broiler and crisp them up on the middle rack for 3-5 minutes. Makes 24 if you don't lose any sheets. If any filling is leftover, freeze it for future use in a small batch of spanakopita, omelets, etc. 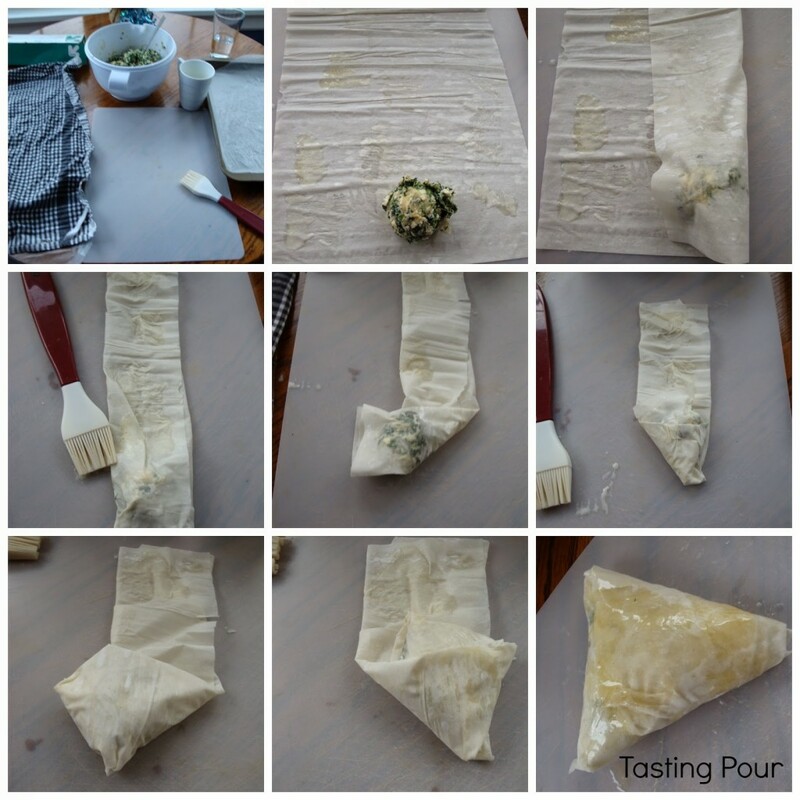 Rolled raw spanakopita can be cooked immediately, stored in the fridge a day, or frozen. I like to re-butter stored spanakopita before baking. You can bake them frozen but I prefer to defrost mine covered in the fridge. It is good to have a healthy respect for filo dough. Dry exposed filo turns to brittle paper. Prepare to sacrifice at least one sheet as homage to the filo gods. Success earns a glass of wine. Failure earns two. This is what my friend said when I taught her to make this dish. “I love problems that can be solved with butter. “This is what my friend said when I taught her to make this dish. Also on the table – Bubbles are so easy to pair! 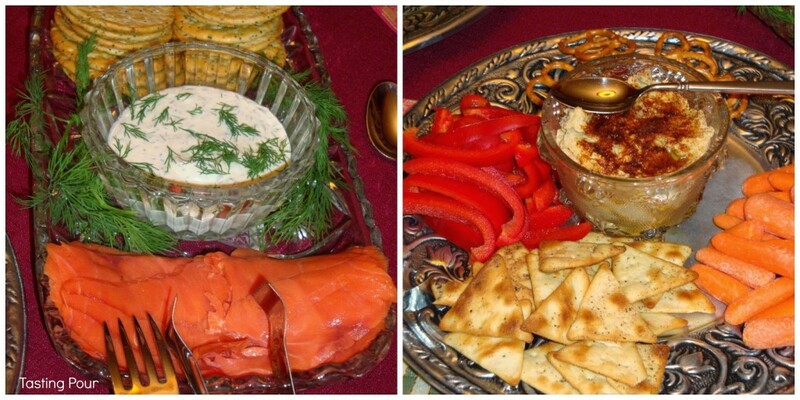 Oregon smoked salmon with homemade dill creme fraiche was also great with Domaine Meriwether. Traditional hummus was made special with a generous drizzle of unfiltered Arbequina olive oil from Oregon Olive Mill at Red Ridge. Really not sure how we lived without this stuff. Let’s see what my #winepw friends have been up to. Be sure to mark your calendars for January’s Wine Pairing Weekend, hosted by Christy at Confessions of a Culinary Diva. We’ll be sharing “New Wine Resolutions – Wine or Region you want to explore in 2015. Join in the #WinePW 8 conversation on Saturday January 10! I love Spanakopita, but I love even more that you can make these ahead of time. Brilliant! Yes Sarah a few make ahead recipes are a must have. Thanks for the comment. Love the make-ahead part. Genius!!! Thanks for sharing. Thanks Camilla. I bet you have some "make ahead" recipes up your sleeve too. Thanks for the comment. It really is an amazing wine. I bought one bottle and after Handsome Hubby tasted it I got half a case. Great apps and I LOVE spinach pie. I will have to try this Domaine Meriweather and make a toast to him and Lewis. You won't be disappointed, Wendy. Thanks for the comment. This looks delicous; love your pairing! Thanks Michelle. You can't go wrong with butter, cheese and bubbles. Love Greek food but have yet to prepare this dish. Thanks for sharing! Thanks Jennifer. Once you make it will become part of your repertoire because it is always such a big hit. You had me at stinky cheese. Love Spanakopita – my grandmothers second husband was Greek. So I was introduced to Greek food at a young age. Big fan. Love your choice of local wine too. Oregon makes more than just Pinot Noir still wine. Have to admit that I've been intimidated by Filo pastry and have avoided using it. Your recipe and hints may now require me to attempt making Spanakopita. Appreciate the advice for making in advance and then re-heating for guests. Thank you! Thanks William. The filo gets easier with practice. If a sheet starts to get brittle, just sacrifice it and move on to the next. You can also make a big dish where you layer the filling with whole sheets of filo lasagna style or even all of the filling with filo on top. This requires less handling of the pastry.